You are here: Home / Blogs / WordPress / WordCamp US 2018 Coming up Next Week! WordCamp US 2018 Coming up Next Week! 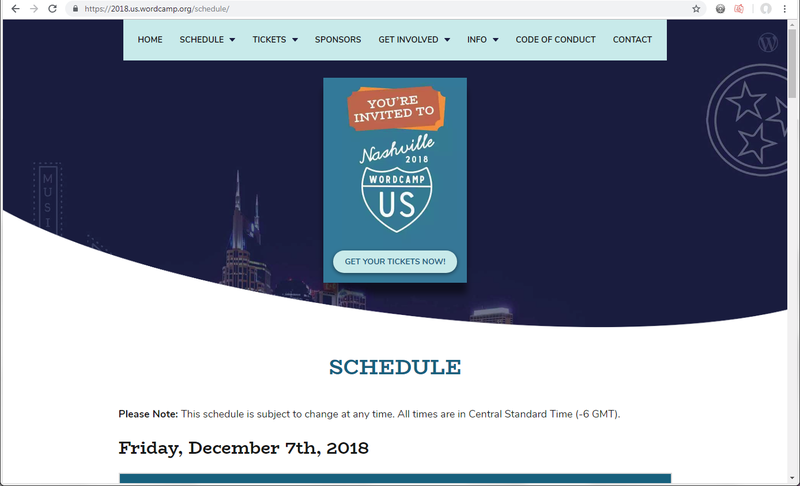 Getting excited about heading to Nashville, TN next week for the 2018 version of WordCamp US! This year, I’m looking forward to meeting other WordPress developers and talking WordPress technology in WordPress terms. One of the nicest things about WordCamps is that you run into WordPress aficionados that you have met before at other WordCamps and WordPress Meetups. You get to reconnect over a common interest, and when not reconnecting, you’re making new connections with those you are meeting for the first time. There are three days of activities; two of keynotes, sessions, panels and presentations, and one day for contributing to the WordPress community. I will be attending all three days. I have gone through the schedules for Friday and Saturday and highlighted the sessions that I want to attend. Sunday is an open schedule where participants in the Contributor day show up, get their assignments, and work with their group. I hope everyone experiences the joy that I feel when attending a WordCamp. There are sessions for ALL levels of experience – from “thinking” about WordPress to WordPress engineering. There’s the Happiness Bar where participants can get help with a particular technical issue, request an approach recommendation, or get an answer to a simple question. There are plenty of spaces and opportunities to socialize and meet others. The WordPress community is very friendly and inviting.